Crownplace Brands is proud to announce the Limited Edition Aladdin Signature Series Grand Vertique Cobalt Blue Table Lamp with hand-painted blue Cosmos shade. The glass pedestals, bowls, and shades were produced by Mosser Glass in Cambridge, Ohio. The shades were finished at Variety Glass in Beech Bottom, West Virginia. The finishing processes included cutting, grinding and dipping to result in a soft satin finish. Finally, the floral designs were hand-painted, signed by the artist and fired-on resulting in a beautifully finished shade. Each Cobalt Blue Vertique lamp will be serialized with a sticker on the bottom of the lamp pedestal. These lamps will also come with a Certificate of Authenticity. The lamp serial number will also appear on the outside of the lamp carton. Only 75 Shades will be produced with the blue Cosmos floral pattern. Lamp comes with brass hardware and MaxBrite 502 kerosene burner. http://jackscountrystore.co/reference/aladdin/aladdinprop65.jpg www.p65warnings.ca.gov. Limited Edition Aladdin Signature Series Grand Vertique Cobalt Blue Table Lamp with hand-painted Petite Violets shade. Brass Hardware. American Made Mosser Glass base and shade. Limited Edition Aladdin Signature Series Grand Vertique Cobalt Blue Table Lamp with hand-painted blue Cosmos shade. American Made Mosser Glass base and shade. Nickel Plated Brass Hardware with Maxbrite 502 burner. Limited Edition Table Lamp from Aladdin Lamp Co. Signature Series, Serialed Numbered. 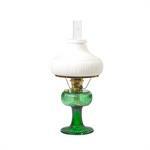 Classic Opal White Shade, MaxBrite 501 kerosene burner.